A month from now..meaning June 24th..we can expect to be in Missouri heading east. After the long stretch through Kansas we will be tired, weary, anxious, feisty, checking teams, bridging gaps, nursing sores, eating whatever we can, checking sanity, ready to finish, ready to win, smelling ripe, able to sleep on a moments notice, unable to sleep at all, thanking the crew, cursing the bike seat, lathering up on sunscreen, praising the Lord for Chamois butter...the endless cycles of this routine will continue until Maryland. If you are like me, I was not able to sleep all that much when the 07 team was on the road...the same thing happened last year. I would find myself wondering, as I stared at the ceiling at 3am..." I wonder where they are now?" With these thoughts I would refresh the map and and check updates and realize that either Bernie was just getting done or Tim was still hammering away or Amy was dealing with weather...and so on. I hope you get sleep but really, I hope you are up late praying for us. Be it solo or team - this is an effort. I applaud the soloists as well as the teams...just to get this going is a race and an epic adventure. Many have asked - how do we do this? How do we plan this out? How many miles do you ride? Do you ride all night? I can answer some of these - tactics are best kept under wraps but in short....the race is 3012 miles. For the soloists...they race them ALL usually riding about 21 hours a day at least. OUCH! Our four-man team - which has TWO soloists from years past - will each complete about 753 miles in about 6 days. That is a lot of miles. Oh and yes, we have a bike going forward 24hrs a day...yes even at 3am. Also asked...are you ready Andy? I think that is best answered in MD but I would have to say YES with a fist pump to boot. Physically I feel as ready as I can be and getting better each day. I will depend upon those that have gone before me to instruct on various things but I have to say that physically and mentally I am ready to put the pedals down to close up some miles. Geez, I make it sound like it will be a breeze...it wont but it will be fun. The difference with the teams is that we will be racing at a faster pace than a soloist and trying to maintain that pace over 3012 miles is the trick...steadfast focus is the key - not to mention nutrition, rest.... Team Strong Heart 09 is ready to embark and ready to make this trip. So whether you are in Iraq (love you Paul), resting with a beverage in MN, looking for dad on video clips while in New Hampshire, watching from the fire station in CO, checking the blog/site from the ATS offices (not during work hours of course), killing time in Stillwater or behind us in a follow vehicle... cheer for us and cheer for Camp Odayin...they are the reason we are doing this. Just so yall know what we will look like this year...these baby's are almost here and yes they are available to purchase but we didnt place a large order up front due to time and all other things associated with getting airborn. Its a full zip this year with some new design aspects - the big turtle and new sponsors...and of course some long time trusted sponsors. We wil have to arrange some sort of list/collection system etc if you want to order some kits. The T-shirts are actually Borah's Tech-Tee - its a micro knit poly shirt - NOT COTTON. Trailhead Cycle will have a handful for sale when they come in but the majority were for crew up front. We can order more and I am guessing SSF will have some prices for these soon. I will leave that in the hands of those who know better. I dont have the bandwidth to collect orders right now so emailing me will result in failure - just sayin'. If somone in SSF can handle this - please do so we can accomodate those that are interested. I wont volunteer anyone. 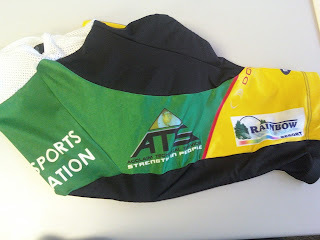 I am jazzed, excited, nervous, worried, happy and ready to RACE! did I mention almost burned out? Yeah, I am almost scared to look at the RAAM site...like opening up the cell bill...you peek quick then close it up real quick to then deal with it later...you know the drill. What I have noticed through this fight - and we haven't even gotten to the start line yet - is how much work there really is to do. Just when one pile is worked through - there is another to take it's place. Be it money, crew, logistics, reservations, expectations, oh - and training, tying up loose ends at work ahead of time, baseball with the kids, boy scouts, cub scouts, marriage, training, crew, logistics...the cycle repeats itself many times over...and sometimes a few times a day. Where we stand is simple - together. This time of preparation is nothing short of a team effort from our friends at SSF, past TSH racers/crew and current crazies that are working to get this ready. My hats off to you all. Oh, did I mention our sponsors and friends of TSH that have parted with their hard earned money and coveted time to help? You have seen us riding in shops, riding in the snow, riding at night, begging for money, telling the reasons we fight this fight (Camp Odayin), logging endless hours on narrow bike seats and for what? To be ready...to make TSH09 another winning adventure...to represent Camp Odayin with more of what has been in the past - success. I cannot speak for our team - individually I mean - but we have a passion that transcends anything we have done before. Tim and Brett have done the ultimate - solo RAAM - but Steve and I are rookies in a brutal field. Our team has relied on prior teams and past experience to prep in all ways possible...and then there is another pile to contend with. Our struggle isn't over but we are in the lead. So to all that I say...bring on the hurdles and the rings of fire...give me your best b/c thus far, TSH09 has overcome so much with the help of so many and we will reach our goal. 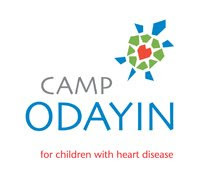 When I look at the struggles I think only of one thing - Camp Odayin. No struggle I can deal with will ever match the struggles they overcome every day. I hope you feel the same way when you reach out your hand to help. $5 gives you some "feel-good" reasons to spend to include: $900 gift card at Trailhead, Kurt Kenetic Trainer, Rainbow Resort stay and the HED Jet wheel-set - slightly used but stellar! 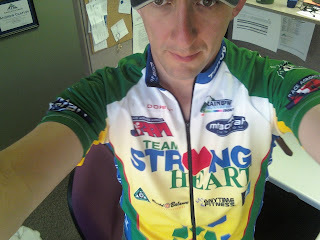 Team Strong Heart is looking for a few good people to round out our crew roster for the 2009 Race Across America. Duties include, but are not limited do, making food for the racers, meeting irrational demands of other crew members, racers and race officials, drinking copious amounts of coffee and Red Bull at all hours of the day and night, helping drive across the country at 20 miles an hour, etc., etc. Seriously, though, we are desperately seeking one or two more crew members for our effort this year. It is a tough job, very much a volunteer position, but pretty much the most epic experience you'll have between the dates of June 18 and June 27 (approximate dates and approximate level of epicness). Team Strong Heart has an outstanding network of passionate people who organize, race and make this crazy thing happen, year after year. E-mail Team Strong Heart member Tim Case, at tim@timcase.net if you're interested. You won't be disappointed if you do!